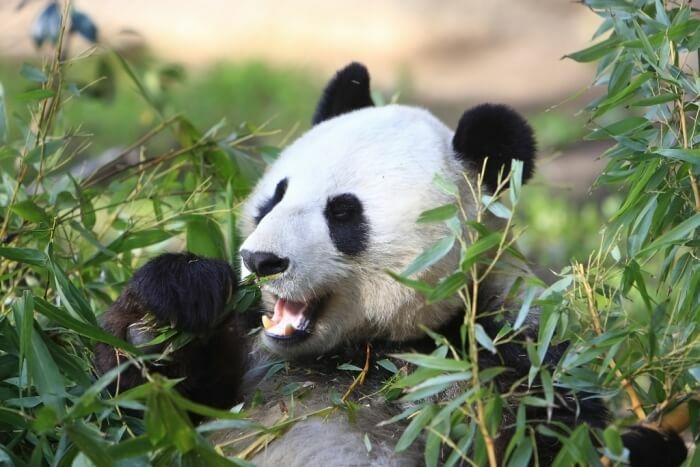 Giant pandas mostly eat bamboo. However, they also eat other grasses and sometimes prey on small animals. The giant panda is a kind of bear, and its digestive system resembles those found in other bear species. However, it has adapted to consume available food in the temperate forest habitat where it lives, which consists mostly of bamboo. Because the panda has a carnivore’s digestive system, it must eat lots of food per day. An average adult panda must consume between 20 and 40 lbs. of bamboo per day and spends half of its day eating. Although pandas live on a mostly vegetarian diet, they sometimes do eat meat. They can eat deer fawn, birds and small rodents, such as pikas.